Jan. 11, 2018 9:59 a.m. The B.C. SPCA is hoping to make vet visits happier and less stressful for pets and their guardians by integrating a new approach to handling and caring for animals called Fear Free. The Fear-Free program has been launched at the B.C. SPCA’s Penticton Veterinary Hospital and will be rolled out in all B.C. SPCA vet clinics across the province in 2018. “Our staff members have completed their Fear Free certification, which encompasses everything from how to design reception areas, check-in procedures and exam rooms that reduce stress and anxiety for pets, to gentle control handling techniques that reduce fear in animals,” said Karen Retallick, practice manager for the B.C. SPCA Penticton Animal Hospital. Staff can also provide suggestions on how to reduce stress while transporting pets to and from the vet. “Our goal is to help animals and their guardians have the best possible experience, from the moment they leave their homes until they return. We believe our Fear Free certification brings a value-added service to all those who visit our clinics,” said Retallick. According to the B.C. 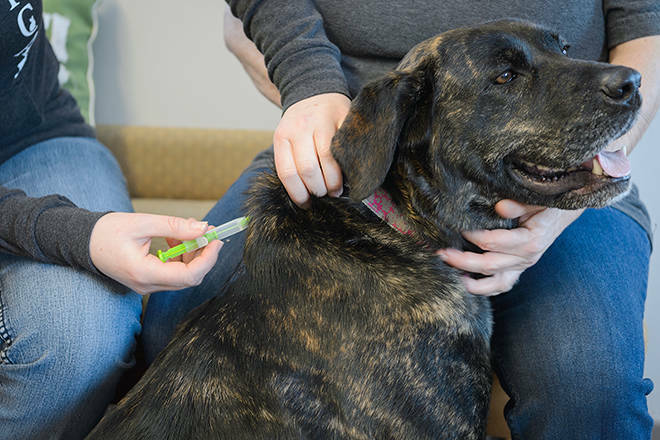 SPCA, the Fear Free approach was pioneered by a Colorado-based veterinarian, who developed the program to create a better and safer experience for pets, their guardians and veterinary health care teams. Kids taken in seconds when truck stolen from parking lot in central B.C.